I received the kitty in the mail yesterday!! Thank you so much for your website! I will check updates on it to see if I can ever return the favor to someone else!! Take Care! I’m looking for a TYCO? 8 inch KITTY KITTY KITTENS. It’s a black, tan, and white Calico cat with filament whiskers and a pink vinyl nose. There is a ball rolling in the head that makes it sound like it’s purring when you move it. I was the proud owner of this Calico Kitty Kitty Kitten. I had it since I was 6 and lost it in a move a few years ago. I’m 25 now, and I still miss my favorite stuffed animal dearly. I would love nothing more than to have one just like it, so that if I have a daughter, I can give it to her. 19255….I have one! And am willing to part with it. Thanks Julie! Britany are in the process of exchanging information about her kitty. If for some reason, that doesn’t work out, I would love info about your sisters! He was definitely my favorite and I still remember when I got him! Sorry Nicole. My sister no longer has hers. 🙁 But I wish you the best of luck!!!! I’m also looking for one. I’ve lost mine too, any body willing to sell? Also, Julie, can you post a picture of yours? If it’s worn it’ll be extra loved. I have a bunch of these kittens! Six are the newer DSI ones and 3 are the older Tyco ones from 90s. The DSI ones are in mint condition and the others are getting a bath now. They were found second hand. My grandkids never play with them, so i am readying them to sell at a doll show. I even bought a basket for them and made a pad for the basket. If any of the Tyco ones are claico I would love to know. Thank you! I have two calico ones…one Tyco one that is soft colors…grey, light orange and white, and the other is the newer DSI one that is black, orange and white. I washed the Tyco ones because I had gotten them second hand and they washed up beautifully…the trick is to use a normal amount of fabric softener in the rinse that you would use with synthetics. All nice and soft and clean. The DSI ones, I got new, but they have been sitting around for a few years…I have run them through the fluff cycle on the dryer with a light spray of Febreeze allergy reducer. All the Tyco kiitens could probably use more stuffing, but I haven’t done anything to them. The Tyco calico has no whiskers…never did. Thanks, Helen, for the information. I just sent your email address to someone who has just asked for a calico. Could you send a picture of the tyco calico please? I may be interrested in it. Also, Dirty Butter- I have 5 of these kitties in different colors, so if you get someone looking for these, let me know! Thank you! I used to have the the tiger kitty kitty jungle kitten and i loved it so much! i wish i still had one to give to my six year old daughter that is OBSESSED with kitties.. I have a kitty kitty kitten for sale. She is cream and tan with her necklace/bracelet. she is in very good condition. IF anyone is looking, let me know. I can send a pic or you can view her @ kidstoys4u on ebay. I am looking for the exact kitty in the picture above for my daughter, she has been devestated since she lost hers over a year ago. It was actually her great grandmothers stuffed cat that she had in the nursing home with her before she passed away. She has been so upset that she lost it! PLEASE PLEASE if you know where I can find one still or if anyone has one available to purchase, send me a message!!! I’m looking for some Kitty Kitty Kittens, if anyone has any they want to sell, please email me at the address, with how much you would sell for. Thanks! Here’s one like in the picture if anyone still needs this one. Does anyone have a Calico Kitty Kitty Kitten they are willing to part with, or sell even? I would be willing to pay and it would be coming to a wonderful home. 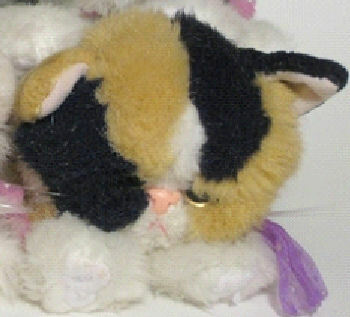 I had my Calico from when I was a small child and it was my favorite stuffed animal. I would carry and take it everywhere with me. Once on a roadtrip with family when I was a teen, I left it in the hotel room. I guess it had fallen under the bed or something and I didn’t realize I didn’t have her until we were a few hours away. We called the hotel but they “couldn’t find it” or maybe they just didn’t really care to look. I’d be really interested in getting another Calico one, but would be happy with any kitten in general I suppose. Needing to fill that small void in my heart since she went missing years ago. Also recently married and planning on starting a family soon, and would love to pass on the adorable little memory holder to one of my children. I have a cream and orange one if you are still looking, let me know. I am looking for a Kitty Kitty Kitten! I had one growing up and took it everywhere with me, until I gave it to a friend who was in the hospital fighting a really bad illness to make her feel better. It was the calico one like the picture at the top. I do not care if it is the same one. I just really have missed it and would like to someday give it to my daughter. I am looking for NEW Kity Kitty Kittens. Must be in the box. DOes anyone have any to sell? I am looking for a black and white Kitty Kitty Kitten. I had one years ago that I carried around with me everywhere and my mom taught Sunday school for 3 year olds at our church and a little girl latched onto it and threw a tantrum when her parents said she had to leave the toy so my mom, thinking I didn’t play with it anymore, told her to go ahead and keep it. Also, I recently lost my black and white cat and it just made my search for this toy kitty even more futile. If anyone has one for sale or knows where I can get it, PLEASE let me know. I will be forever grateful! My neighbor has many stuffed animals. And she gave my granddaughter a Calico Kitty Kitty. She loves this cat, and named her Rosie. I did not know they were so old. But will look for some at some thrift stores, I shop at for anyone here, and for her. I did go to ebay, and they were so pricey, but they had many styles and colors. So if i find some. I will let you know. I have 10 of the original tyco kitty kitty kittens, all in used but good shape. If anyone is interested in purchasing them let me know! In search of the calico one please! If there are pictures please send in a email with their price please!!! Looking for white or grey kitty kitty kitten (tyco) my daughter lost her’a in a car tow when she was younger and still talks about it..want to suprise her?